I consider planning an itinerary for a food-focused weekend in New York to be a formidable task. I don’t get to New York nearly enough, and every meal counts. Do I approach anything else in my life with such intensity? Probably not. Let’s face it…the dining options in this city are endless, but so are the opportunities. My trip over Presidents’ Day Weekend includes visits to three restaurants that share common attributes, despite culinary diversity. Cosme is a Mexican restaurant, Atoboy is Korean, and Pondicheri features Indian cuisine. Their chefs incorporate traditional ingredients from their countries of origin into their food, while veering brilliantly off-course with innovative touches and modern twists. Something else this trio of restaurants shares is a Flatiron District location. There’s something satisfying about concentrating most of our dining into one specific neighborhood, rather than frantically crisscrossing the city. We station ourselves at the nearby Kitano Hotel, and are able to walk off at least a few of the calories. Chef Enrique Olivera of Cosme rose to fame as chef/owner of Pujol in Mexico City (ranked #25 of World’s 50 Best Restaurants 2016). He opened Cosme in the Flatiron District in 2015. In the simplest of terms, Cosme is a modern Mexican restaurant featuring small plates. But Cosme isn’t simple at all. Yes, you will find tostadas, tamales, and carnitas on a menu peppered with Mexican mainstay ingredients like poblano, queso fresco, chorizo, mole, cilantro, and salsa verde. 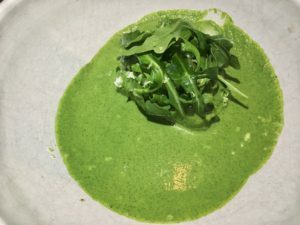 Cosme’s food, executed by Chef de Cuisine Daniela Soto-Innes, is notable for conceptual dishes that originate in Mexico and land squarely in New York. Sublime fish dishes include sliced raw fish with poblano, avocado, and lime and branzino a la talla served with warm, fragrant tortillas made in-house from corn imported from Mexico. Vegetables at Cosme are dazzling. Seared brussels sprouts with sumptuous mole verde is blanketed by crispy strips of charred kale. Broccoli tamal with goat ricotta begs for a spoon to sop up every bit of the sauce. I am truly forlorn when my server removes the plate, which has far too much of the glossy, green sauce remaining. El Ninja cocktail makes me swoon, with mezcal, gin, and vermouth getting a lift from shiso shrub, ginger, and lime. 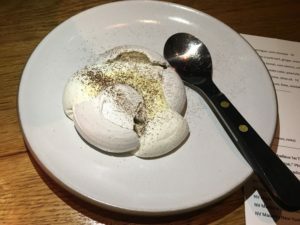 Mention Cosme to someone who’s been and they’re bound to sing the praises of corn husk meringue. The signature dessert has an uber-creamy texture, and a subtle flavor of corn that sneaks up on you slowly. The delicious memory lingers on. 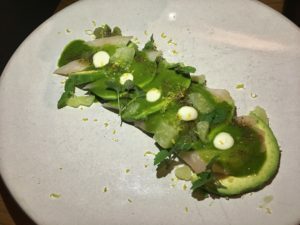 Cosme is expensive -small plates range from $17 to $30- but if you order carefully, it doesn’t have to cost a fortune. 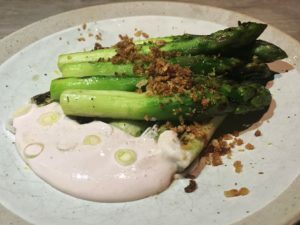 My husband and I are fully sated by four savory dishes – two fish and two vegetable- which comes to just under $100 (drinks and dessert are additional). Bill Addison of Eater puts Cosme on his 2016 list of “The 38 Best Restaurants in America.” Learn more about Enrique Olivera on “Chef’s Table,” Season 2. Atoboy is the restaurant that fuels my adrenaline. Chef/co-owner Junghyun Park is the former Chef de Cuisine of Jungsik, a two Michelin starred Korean restaurant in New York. The Flatiron district restaurant is a study in contradictions. 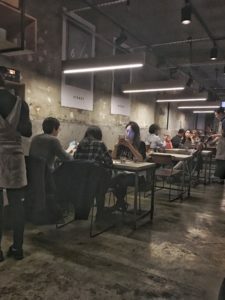 Concrete floors and walls and long wood tables say casual, but beautifully executed Korean small plates say so much more. What makes Atoboy a marvel is the price, given the quality and complexity of the food. For $36 (prix fixe), three courses can take your breath away. Atoboy features banchan, which are Korean side dishes. Here they are converted into the centerpiece of the meal. Tempura-battered chicken served with thick spicy peanut sauce is the must-try recommendation from our server. It’s incredibly satisfying, and extremely filling. 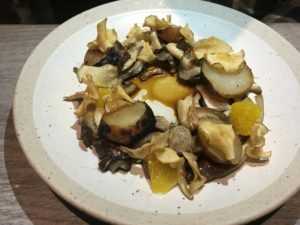 Our “holy crap” moment is prompted by sunchokes scattered between oyster mushrooms, black truffles and oranges. The vivid combination of umami and citrus is delightful. On the smart and sophisticated side is asparagus with spicy cod roe, crispy shallots, and egg yolk. This is what a winning restaurant tastes like, and we cherish every bite. Dessert is a worthwhile add-on. Pumpkin cheesecake with candied pumpkin seeds is a knock-out. Dishes at Atoboy arrive at a lightening pace, and if we weren’t crunched for time, this could be a negative. On the bright side Atoboy is a great pre-theater option, if you don’t mind a short trek to a Broadway show. I much prefer hot-footing it, if it means if I can enjoy a meal of this caliber. Pondicheri is the New York City café I could visit three times a day. Considering it’s open for breakfast, lunch, and dinner, this isn’t out of the question. Pondicheri is a perfect combination of Indian food wonderland and health-food mecca. 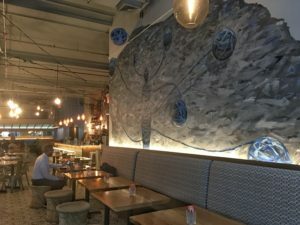 Chef and owner Anita Jaisinghani brings Pondicheri to New York from Houston. According to a piece in The New York Times, she plans to open more of the brand across the country. The restaurant website espouses a seven-point mantra which includes bringing forth “the most nourishing, vibrant and memorable flavors” and offering non-traditional authentic cuisine inspired from different regions of the country. “Quality is queen” is another promise. All are fulfilled. The menu overwhelms with potential. At lunchtime, food is ordered at the counter; at dinner time its table service. My husband and I throw caution to the wind and over-order, rather than being forced to make difficult decisions while on vacation. Love lamb? Don’t miss lamb mint bun kabab. 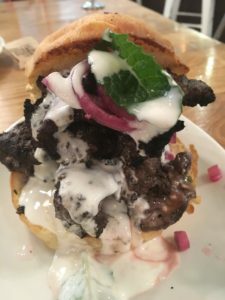 The over-stuffed brioche is filled with thick chunks of grilled lamb which are showered with mushroom spread, tamarind chutney, and then sprinkled with apple mint slaw and pickled onions. Chaats, salads, curries, Indian breads and fries beg to be explored, and who are we to resist? 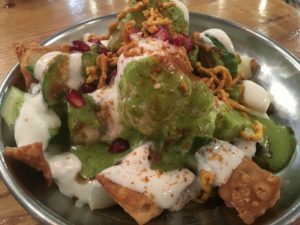 Sweet and spicy papdi chaat is a whirlwind of contrasting textures with semolina crackers, lentil dumplings, cumin yogurt, and tamarind and cilantro chutneys. That flavor mantra comes to life in this bowl. An optional add-on that’s mandatory are desi fries. I adore these curly fries coated with a kicky masala spice blend. Pondicheri baked goods – a mélange of cakes, cookies, and fruit and nut bars- tempt from their counter perch. For us, these must wait for another visit. And there will be another visit. Namaste for now Pondicheri. My food obsession may be a contributor to exhaustion and even a modicum of anxiety. I accept the consequences of my madness. When the end results are meals at Cosme, Atoboy, and Pondicheri, I consider this akin to winning a culinary trifecta. I would be remiss if I didn’t mention where we had brunch. Because, of course there was brunch! Don’t miss Melissa’s Sticky Buns. 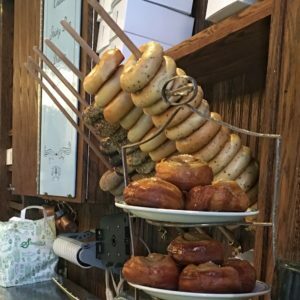 Some consider the bagels here the best in the city. They’re pretty, pretty good. Chef/owner Gabrielle Hamilton’s book “Blood, Bones, and Butter” is a gritty look at what it takes to be a chef. Prune opened in 1999 and is still going strong. 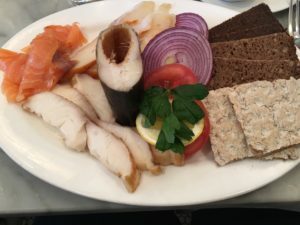 A fantastic fish plate with smoked salmon, sturgeon, sable & chubs features fish from Russ & Daughters.